NiliPod - Film and Movie Reviews: Hail Caesar! Starring movie legends George Clooney, Channing Tatum and Scarlett Johansson, amongst other big names, Hail Caesar is being described as something of a 'screwball comedy' and 'superbly silly', as well as the 'Coen brothers' worst film'. With a rather misleading title, the film concentrates on the world of Hollywood movies in the 1950s and the kidnapping of one of its stars. 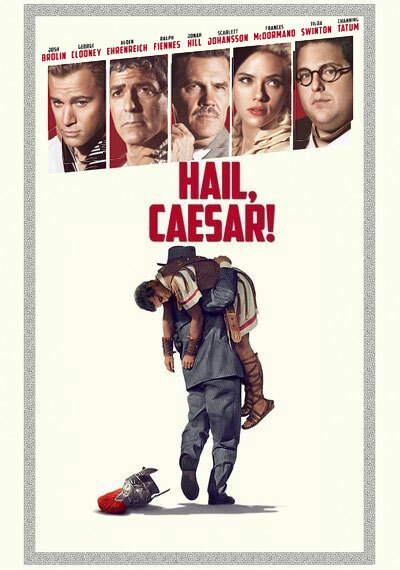 Based around a studio's production of a film called 'Hail Caesar! ', actor Baird Whitlock (played by George Clooney) is kidnapped after drinking a glass of wine that has been drugged, and soon a ransom note appears, demanding that the sum of US$100,000 is paid for the return of Whitlock. The costumes are great and for many this will be something of a nostalgic reminder of the old-fashioned movie industry of yesteryear, but for me, I thought that it was average at best. The storyline is rather chaotic and self-indulgent, but what really makes this just about watchable are the stars and the great routines. These include Channing Tatum's hilarious sailor dance and the elaborate synchronised swimming routine, where Scarlett Johansson appears as a beautiful mermaid. There are also some funny jokes and one-liners dropped into the story, which lift things a little, but only just. Nili Rating: 3 out of 5 - I would have given this a score of two if it wasn't for Channing Tatum's hilarious dance routine, which was the best part about the movie in my opinion! Perhaps it should be renamed as 'Hail Channing!' Just a thought.